I had to go out and smell the roses up at the Seine because it is so beautiful today. Many of you keep asking us how we're doing in the hot weather here. It is not too hot -- only about 82 degrees right now, and not humid at all. 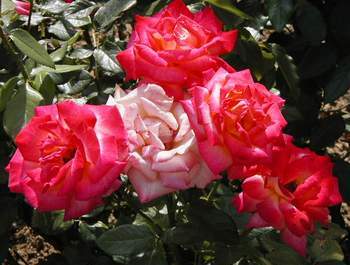 These roses live in the narrow park/pedestrian way between the Port de la Bourdonnais and the Quai Branley next to the Seine, not far from the Eiffel Tower. It is a lovely place to walk. No cars. Wide dirt path. Lots of flowers. 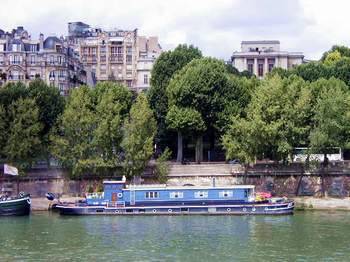 And views of the Seine. To get there, I went up the avenue de Suffren. 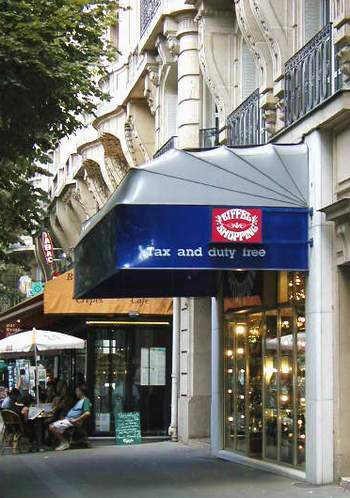 I passed the Eiffel tax free duty free shop run by the family of the elderly Chinese man that I helped on the 19th. I went in to look around. The door was wide open, but nobody came out to greet me. I could hear sounds of glasses, silverware and dinner plates clinking, so I assume the family was in the back room having lunch. It was lunchtime, after all. Before my walk, I'd made a gourmet omelette for Tom and me, so I wasn't thinking about lunch at all. Dinner last night was very simple. We just had steak with Bearnaise sauce and salad at the North African resto, Le Tipaza, just around the corner from us. Mohammed recognized us (first time he has this summer) and greeted us with a warm handshake. We were given the prize table in the corner, in the window. It was like having our own private dining room, with a view on the avenue. I love the mis-en-bouche (tiny, free appetizer) that they always bring to the table immediately after you arrive at Le Tipaza. It consists of a few small pieces of cold, marinated, cooked carrots and potatoes, very spicy, and some top-quality olives. Yumm. After dinner, it was early enough that we could get a few groceries at Monoprix - a store that stays open until 10PM!!! A rarity in Paris. Crossing the tiny Place de Buenos Ayres while walking along the avenue de Suffren, I caught this view of the Eiffel Tower. By the way, if you'd like to see more photos of Paris, check out the web site at http://www.phan-ngoc.com/fred/paris/index.html -- it is composed by a real Parisian named Fred. The other day Lance Armstrong took a fall, and the next day, we read differing versions of the cause of the incident. Fortunately, we'd also seen it on TV, so we know who's right. The International Herald Tribune, owned by the increasingly unreliable New York Times, had it wrong. Their reporter wrote that Armstrong ran into a spectator's hand. No. The French papers, Le Figaro, Le Parisien, etc., had it right. Le Parisien was cute, the way their reporter told the story. He wrote that "it was all in the sack." One of the big sponsors of the Tour de France, the bank Credit Lyonnais, had given away yellow satchels to a number of spectators. A child holding one of these satchels inexplicably stretched out his arm as Lance rode past. The handle of the satchel hooked the right handlebar of Lance's bike, and down he went, along with the rider behind him. The other lead riders held back a bit until the two fallen riders could regain their positions. Such courtesy. Lance did the same thing for Jan Ullrich two years ago. After the fall, Lance's expression was completely different. I thought he was angry. Turns out he was just desperate, and he had a rush of adrenaline from the fall. The adrenaline unleashed an incredible amount of power in Lance. He zoomed ahead and ended up winning the stage. He greatly increased his lead over Jan Ullrich. After this stage, Le Parisien reported, it may be "all in the bag." Lance may have this Tour de France wrapped up. We'll see. At any rate, since the winner isn't clearly determined yet, many more people are watching the Tour this year. The French were really bored with watching Lance win last year. Nobody was even near his time in the second half or so of the Tour. On my walk yesterday, I stopped to check on the progress of the fray�re that I found under construction last year. It still isn't finished, but it getting closer. A fray�re is a place where fish reproduce. What do we call it in English, I wonder? The bureaucrats have been putting lots of effort and money into cleaning up the Seine. They've been doing it for years. Now there are signs along the banks that proudly inform us about each of many species of fish that now flourish in the Seine. 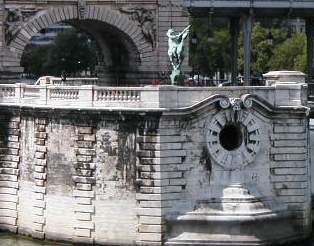 Swimming at Paris Plage is forbidden. But the bureaucrats tell us, in cleverly designed and written full-page newspaper ads, that swimming is forbidden BUT the Seine is CLEAN. The reason it is forbidden is because of strong currents. I'm sure there are all kinds of dangerous things on the bottom of the river, too. Anyway, the color and opacity of the water doesn't appeal to me, as a swimmer. 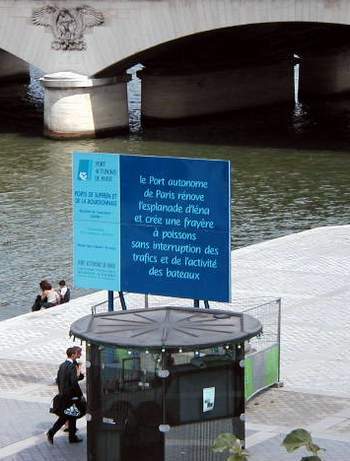 The sign says "The Port of Paris renovates the esplanade d'Iena and creates a fray�re for fish without interrupting the traffic and activity of the boats." Here's the fray�re, at left. 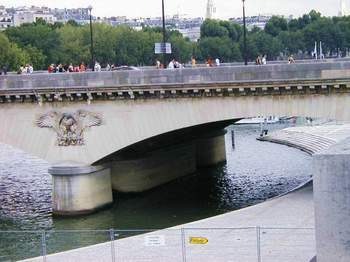 It is an arch cut out of the pavement on the left bank of the Seine, between the Pont de Bir Hakeim and the Eiffel Tower. The cut out created a space where they could have shallower, calmer water. Fish like that, I guess, when it comes time to reproduce. It might be a safe place to swim, but I think I'll pass. 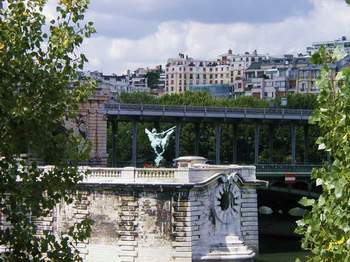 At the northest end of the All�e des Cygnes is a memorial dedicated to Bir Hakeim, a critical battle that took place in 1942 where the British and French defeated the Germans and Italians (see photo at left). Wanting to know more about it, I did a Google search. Have you ever wondered what kind of result you'd get if you use Google's "translate this page" feature? Well, I used it to translate a French web page about Bir Hakeim and this is what I got. Interesting language. Last night we dined at L'Epop�e. Madame was absent, but Monsieur was there to greet us. He was extremely nice. He gave me a free glass of champagne as an apperatif. I had the langoustine (prawn) ravioli with curry sauce again (okay, you can drool now, Bob E.). Langoustine here tastes just like lobster. The raviolis are about 1 and a half inches square, and you get just five of them. The sauce is so good I have to break up bits of bread and use my fork to get every drop of it. Then I had Daurade Royale. Daurade is a fish, relatively small, with a very pleasant taste. The Royale part refers to the sauce, a rich, white, creamy sauce with just the right amount of subtle French seasoning. The daurade came with potatoes pur�ed with butter and, as Monsieur so kindly explained, fine green olives. They were superb. Because of Atkins, we could not eat them all. We explained to Monsieur that "nous sommes en r�gime," but that we just loved the potatoes. He accepted that very well, grinning ear to ear because he knows we love the cuisine there so much. 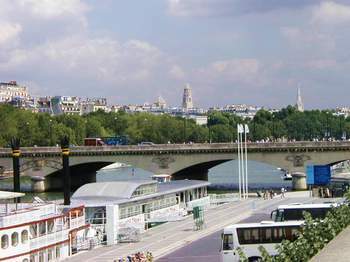 <Previous Next> Above left, flowers at the Place du Kyoto, near the Pont de Bir-Hakeim. Nearby is the Japanese cultural center, which has an interesting shop in its lower level.